In Jamaica in 1976 a group of gunmen stormed Bob Marley's house, and although the singer survived, the men were never caught. This incident forms the centre point of Marlon James' stunning A Brief History of Seven Killings. In the novel, James fictionalises the build up to the shooting, and its long reaching aftermath, as seen through the eyes of gangsters, journalists, politicians, the CIA and more. A Brief History of Seven Killings isn't at all brief - my paperback edition is 686 pages - but it never feels like a long novel, and it was never a chore to read. It did take me a while, around 80 pages, to get used to the voices and the rhythms of the characters, especially the gang members who use words and phrases I was unfamiliar with but whose meaning I quickly guessed. Once I made a bit of headway with the book, it was easy going, and I flew through it, especially the last 300-400 pages. James is brilliant at building to the shooting of Marley, who is referred to as The Singer throughout the book, giving him an almost mythical quality. The shooting is almost mythical as well. I knew it was coming, and I just wanted to get there, but I also really enjoyed the build up and spending time with all the different characters whose world I had never been exposed to before. A Brief History of Seven Killings is told in first person with chapters alternating through a roster of characters, all with extraordinary stories and opinions and motives for doing what they do. When the shooting does happen, James deals with it in an absolutely jaw-dropping way. 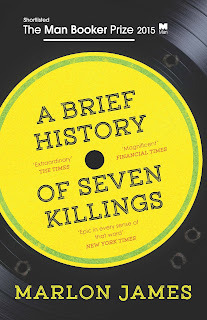 I won't give too many details, but up until the point of the shooting I thought A Brief History of Seven Killings was a very, very good book. Once I read the day of the shooting, from the points of view of two characters in particular, this book was upgraded to phenomenal. James' skill at writing is evident, but that skill never ever gets in the way of A Brief History of Seven Killings being a brilliant story. Also dazzling is James' choice to have a 'narrator' who pops up after the significant killings, who is actually dead. It sounds completely wrong, but it works without issue. A Brief History of Seven Killings is a very political novel - territory is important, as is the desire for a better life, and politics - whether that's through official channels or on the street - is important and a major motivator. But the thing that struck me the most as I read the novel is how James is describing what is very much a man's world. There are female characters, but we only hear directly from three (these three are brilliant, complicated women). The male gangsters largely see women as their property, although there are a few exceptions - the wives often get respect not afforded to anyone else. Mostly though, women are to be used and discarded, and violence against women is just a way of life. It's heartbreaking to read chapters in the first section from the point of view of Nina Burgess, who matter of factly deals with a terrible crime against her mother like it's nothing unusual. For me the treatment of women was one of the most captivating parts of a truly captivating novel, and the voices of Nina, Kim and Dorcas offer a counterpoint to and deeper insight into the actions of the men in the novel, and the consequences of those actions. A Brief History of Seven Killings is an epic novel, in size, in scope, in telling. It's impressive, and I'm in awe of James' talent, and I would urge everyone to read it. How I got this book: From the publisher, Oneworld. This did not affect my review.